In the wake of Knightfall, Catwoman finds herself working for Bane, who now runs Gotham City from the shadows. She steals for him, under the watchful eye of a handler named Leopold, whose only mission in life is to make sure shes not skimming off the top. 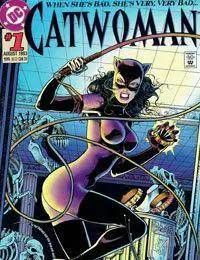 In her civilian guise, its revealed that Selina has taken a young runaway under her wing, a girl named Arizona, who reminds her of her old friend from the East End, Holly Robinson.